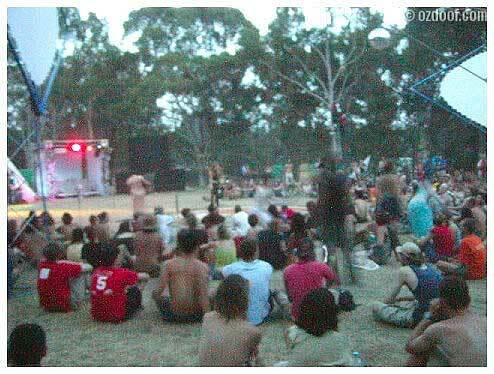 A glimpse into the heart of the global phenomenon of the open-air psychedelic trance gatherings. 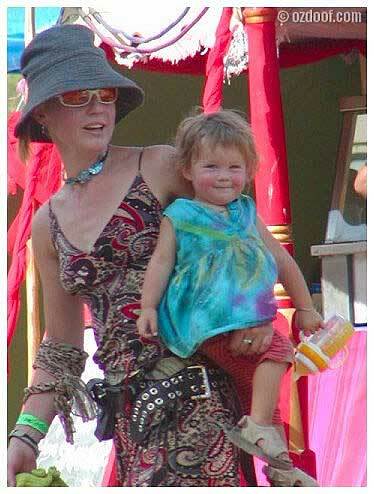 It is a dusty and dry Monday afternoon at the Rainbow Serpent Festival, located two hours drive west of Melbourne. The festival has been held on Australia Day weekend for the last five years, this weekend drawing about four thousand revelers. 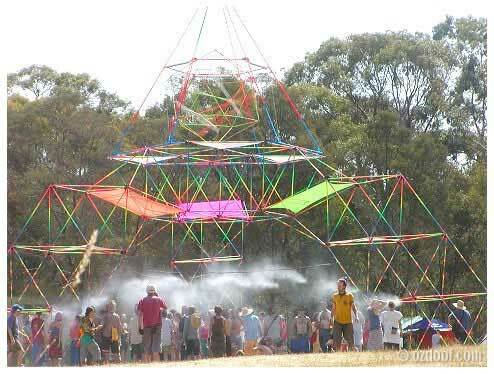 It is the last of a string of such festivals held along the east coast of Australia every summer. A grove of trees in the middle of the campsite is serving as the final refuge for the last remnants of festival goers - the three-day festival may be over, but the party continues. A dozen or so hammocks crisscross the area enveloped in a mesh of colorful banners and tarpaulins. A herd of combi vans and 4WDs surrounds the trees. This is the only sound system, to still be pumping out the rhythms and around three score trancers have descended on it, like brightly colored moths around a flickering candle. The system is not officially part of the festival, but a private “renegade” setup - one of several such systems at the festival. About a dozen people are sporadically dancing to the unobtrusive beats emanating from the speakers. In the distance the festival site is being dismantled and most of the campsite around us is empty. Of the people around me, perhaps a third are from Melbourne and a third from other parts of Australia, mainly from Sydney and the NSW north coast, the rest hailing from all corners of the globe - places such as Sweden, the UK, Greece, Israel and Japan. Many of the faces surrounding me have become familiar over the last month on the festival trail. Of those unknown to me before many have become friends, others I have not officially met, but knowing smiles are exchanged nonetheless on the chance passing. A primordial bond seems to have been awoken within by the long nights and days spent stomping together, a tribal instinct dormant beneath the veneer of modern superficiality remembered. Commenting on this experience of trance festivals, Lui, from Sydney, who has made the pilgrimage to every one of the last five RSFs, says, "The ritual of dancing outdoors in large groups of people is as old as time, and this is the modern day version of it. I think Psy-Trance is a extremely tribal experience." DJing under the name Raptor and promoting parties as part of the Yak and Yeti crew, Lui has been a part of the Sydney trance underground since the mid-nineties, recently launching his latest project, australiens.net, a site dedicated to the Australian Psy-Trance community. He adds, "The festivals bring us all back to being part of something which I feel society has kind of lost - a real sense of community." Benjamin Richards, who organizes the Summer Dreaming festival outside Sydney as part of the Artcore collective, reaffirms these sentiments. In its 4th year, this year's SD festival, running on the weekend before Rainbow Serpent, drew over 2000 people. 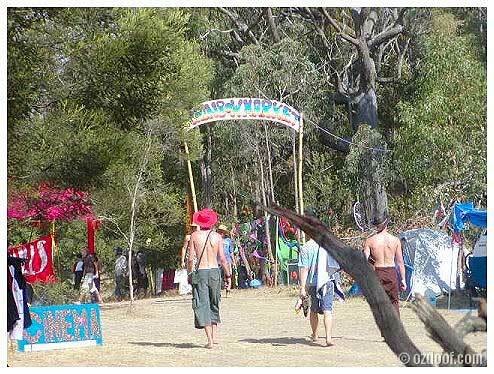 Set in the spectacular Glenworth Valley, north of Sydney, the festival was nestled in the lush greenness of the valley, a river running through the campsite, with 2 nights of music from local and international DJs and live artists.
" I look at it like creating a biosphere, a miniature town or community that is constantly morphing and evolving into parts of space and time. ", says Richards about the organization of SD. "... We create a platform that is up to the people we bring together to fill with energy and life. I just want to create the platform have it reach far enough across the globe to bring people from different cultures and persuasions together to create a unique vibe and collective unconscious - the basis of the collective trance dance experience. I have traveled the globe, partied on many different continents, I am monolingual, but have shared very special things with people that I can’t verbally communicate with, but for a certain space in time, we have walked together and spiritually ascended. I hope to recreate that feeling on others that I have felt myself, something internally profound." When asked about the significance of his own experiences Richards relates, "Trance for me is more personal, an explorative internal meditation that makes me feel more connected to myself and to other people when I am in a party environment. The thing that is so special about it for me is it provides a soundscape that is open to your own interpretation... I want my creative mind to be inspired." The themes of tribe, community and internal exploration weave a common thread through the global trance culture, although simply having a bloody good time dancing the night and day away to the music you love, all cultural inhibition abandoned, should not go unmentioned. 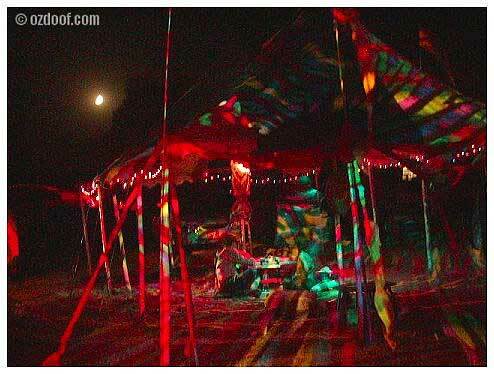 The fact that the parties are outdoor is also a huge drawing factor. When compared to the beauty of the Australian bush or the beach, where the blue sky is your ceiling, space is virtually unlimited, and walking away from the party for some peace and quiet you find yourself in the serenity of nature, rather than some seedy back streets of the inner city, smoky, crowded clubs quickly lose their appeal. Frequently parties and festivals are located near a swimming hole or the beach, providing an opportunity to cool off in the morning. The day after the party is often whisked away in these beautiful surroundings, and one finds themselves internally recuperated, rather than drained as is usually the case after a night out on the town. A brief look at the history of this elusive musical genre reveals much about the nature of the surrounding culture. An entity entirely apart from the flamboyantly melodic and anthemic styles of Trance generally associated with clubs and raves - an association generally shunned within Psy-Trance culture – Psychedelic Trance or Psy-Trance emerged from and subsequently grew to encompass the Goa Trance sound that went through a brief but intense period of popularity in the mid-nineties. Goa, on the west coast of India, has been a destination and a home to westerners in pursuit of altered states of consciousness through all night dancing under the influence of psychedelics for over thirty years. The music at the parties on the beaches and in the jungle around Goa progressed from Reggae, Dub and Psychedelic Rock in the 70s, to early House, Techno and Industrial sounds in the 80s. DJs and musicians, inspired by their experiences in Goa, coming home, wanted to recreate the incredible vibe they had discovered at the parties there. The club environment did not lend itself to this experience, so the parties were taken to the outdoors, the connection with nature seen as an important part of the psychedelic journey. At the same time, the music was sought to push the experience further and thus out of the fusion of Acid House and New Wave Industrial, with a pinch of Psychedelic Rock thrown in, Goa Trance was born. The genre was all but absent from the world of electronic music by the end of 1997, going back into the underground, although in Israel its popularity never abated, with 30000 people turning out for a protest party in Rabin Square, Tel Aviv in 1999, to protest the county’s draconian police policy on Trance events. Through a reinvention of itself as Psy-Trance however, the culture survived and in the last three years has mushroomed in popularity, with new artists and scenes popping up all over the world, from Mexico to China. With a strong influence from Techno, the genre has diversified, spawning a myriad of sub styles that have pushed musical boundaries in completely new directions. For example, Minimal Trance has emerged as a hypnotic and atmospheric style, possessing an entrancing ambience within a structure of crunchy technoid beats. Other sub genres have drawn on Breaks, House and even Jazz and Heavy Metal. Sharing some of the ideals with and indeed having its distant roots in the 60s counterculture, does not stop the new trance hippie culture from simultaneously wholeheartly embracing technology, rejected by their cultural fore bearers. Trancers are acutely aware that the culture they love so much would not be possible without technology. Not only would the music not be created or the parties produced, although surely the tribal trance dance gathering predates the electronic gadgetry of today by some millennia, but without the World Wide Web and email, not to mention relatively cheap travel costs, there would not be the possibility for the existence of the global trance network that has emerged. In the last year or so, open-air Trance festivals drawing thousands of partygoers, have been held in Morocco, Brazil, Zambia, Portugal, Thailand, Greece and Germany. The biggest festivals in Europe, such as Boom Festival held in Portugal in 2000 and the Solipse Solar Eclipse Festival in Hungary in 1999, have numbered 15 000 – 20 000 people. On the subject of the role of technology in his life, Richards says "In my home I am surrounded by computers and technology, my turntables for when I want to create a flowing journey that lasts more than 10 mins, my studio when I want to baffle over how to let out what is inside of me. I guess that is the other thing I love about trance and the outdoor festival scene - we are utilizing state of the art technology in every way to create these experiences and enriching them with the most powerful force in the universe - Gaia." 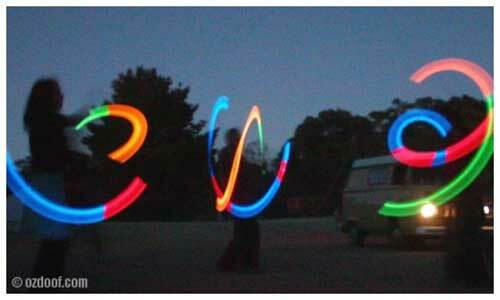 Another aspect often seen as inherent in this cyber hippie trance culture is the use of drugs and particularly psychedelics. 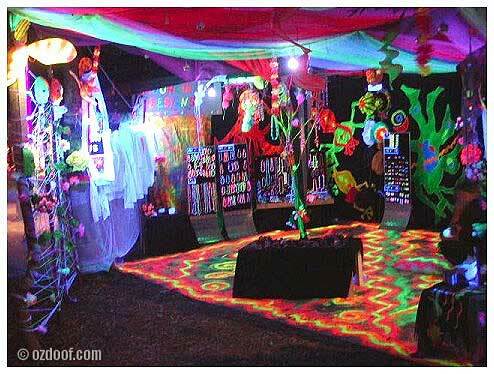 LSD, Psilocybin Mushrooms and Ecstasy are common at parties, while DMT and Salvia Divinorum are seen by the more experienced as tools to explore further some of the realms that the psychedelic trance experience may have opened up. However many trancers, particularly those that have been involved with trance culture for many years, preach caution in drug use and for many abstinence is seen as the only way forward. Shahar, who runs isratrance.com, one of the most popular Psy-Trance related websites on the Web, had the following to say on the subject: "I feel sad that a lot of people are dependent on the use of the drugs to attain what trance can offer them. Drugs may open a window for those that can’t open it themselves, but to get there for real, you need to do it yourselves. Usually the more you use drugs, the smaller and further the window becomes until it fades and disappears." "Trance can bring you consciousness naturally”, says Shahar, “ - just melt yourself in the music and forget your body - it comes naturally and than it stays forever. A party can bring us back a unity we no longer have in our lives - we have ourselves, family, and then its city, state. The tribe is missing. When you dance all night and swap energies with the people around you, discover their faces at sunrise and realize you already know them, and leave the party with the energy of 50-2000 people sharing, you get the tribe back in your life." And thus we return to the theme of the tribe. This last month has taken me to the week long Exodus Festival near Byron Bay, The Awakening Festival near Brisbane, then down to Summer Dreaming near Sydney and finally to the Rainbow Serpent near Melbourne. 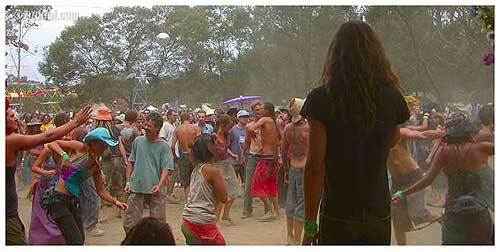 After each festival more and more smiling faces on the dance floor have become familiar. Experiences and journeys have been shared, the tribe has expanded and grown closer together. And although it is now time for some of us to returns to our home tribes, we return enriched with new friendships and connections. Already there is talk of a visit to Europe for a run of the festivals there on the home turf of some of my new friends. As I sit back in a gently rocking hammock, I find myself becoming a little nostalgic about the events of the last month. Scanning the saturnalian party aftermath around me, I smile to myself, remembering a joke someone had made in an Internet forum recently. "When you dance with the rainbow serpent, the rainbow serpent doesn’t change, the rainbow serpent changes you." All photos are courtesy of http://www.ozdoof.com. the story was written after the 2002 summer, not this summer, thats why it talks about Summer Dreaming. Feel to free to email me, Matan! just noticed I typed my email address incorrectly in the last message. 1. if all the people on this planet would listen to trance music there will be eace in this world! 2. if bethoven and mozart would have been living today they would have make trance music- simple as that! and remember: "all the people on this earth are truely one"
Just wonder if Matan got the booking ? la la la la la la la la la la la la la la la la la la la la la la la la la la la la la la la la la yea i just wanted to be a part of it ....................... yea ! Great Text, Boris, you really give newbies a good view of what Trance is all about... If everybody read your text and understood what it means the parties here in Brazil would be totally different.. It's great to know that the spirit still exists around the world, I'm the one who's in the wrong country that's all..!! Like your ideas of drug use,i feel becoming a crutch that is tempting to rely on more and more. very nice words ... although it is IMPOSSIBLE to desribe something that you have not felt !!! I went drug free to a doof recently .. it was beautiful ... I will do it more often !!! hopefully will meet some people who are up for a trip to europe next year ... to hunt out the underground scene's .. I hear they are magic, if you can find them !!! trance dance in 1979. The explosion of trance at the beginning of the 90s was very exciting for me and has consumed my life. Let the music take control and the world will change. Dream reality. Djs are the shamans of the 21st century. last week in austria a compleatly lagle prival party for 300 people was crashed by the police with out reason. but insted of just giving up and going home we just did not leave and always got everything runing after the police were gone. on saterday the police came 3 times and puched the emergancy stop button on the genorator and after drove quickly away. it was very funny I must say. postive reblion in a peacefull way is very important when dealing with melonheads. yeah trance just make me happy..u should come 2 portugal sometimes..u have goog people who loves trance 2...boom festival is next year in portugal..cant wait but have 2 work n get money first cus im abroad in northen ireland...alrite c u in portugal if u go...ip ip ..boom festival. Psychedelic trance is a very powerful thing. I used to broadcast a lot of it in my radio shows. This music has enough energy to overcome that inhibation and dullness that the mass-media and the governments are inducing to people. People live in a kind of invisible jail, it's mind slavery. This music really makes people more self-conscious. Psychedelic trance music provokes an awakening after which nothing is the same. Not one thing has brought me closer to my fellow human and heavenly spirit than the music that can be heard at trance parties. My best memories and closest friends have their roots entwined and meshed within the music and beat of psychedelic trance. I find 3 very interesting points here..
And I have live a story like this in a different place. 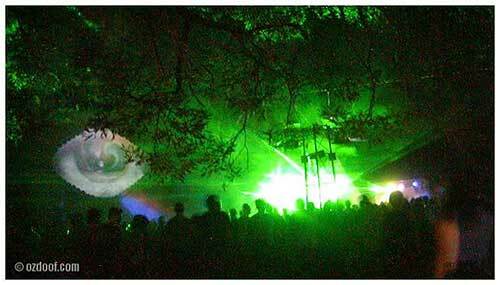 I´m into psy-trance since the beginning of this millenium. And I still love it soooo much. Here in northern germany we have a lot of very good partys, many of them still keeping a certain kind of spirit you can´t find at other places. I´m afraid that one day this spirit will get lost, that it all will become commercial, that the hippies will disappear from our partys. But at the same time there is always so much positive energy that surely people will develope and stick to authentic goa party culture. I´ve been to psy-parties in italy and spain - it´s such a trully global culture! 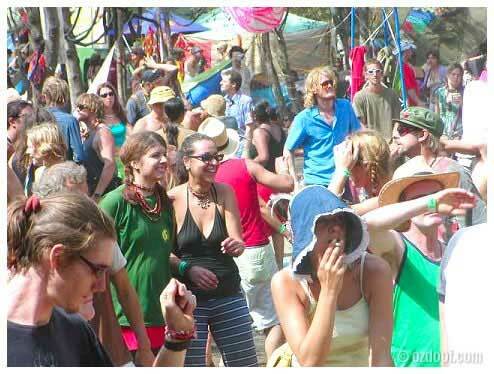 Trance on, you goa-lovers of this planet, and lets allways defend our culture of global psytrance.